When I met Dana and she told me about the incredible bond and business she shared with her 84 year-old mom Jeanne, I was instantly in love. With their company Green Buddha and a motto of “AOG-Attitude of Gratitude”, these two women have dedicated themselves to loving one another and sharing that premise of love, community, and graciousness with everyone around them. Their inspiration couldn’t be a better story on this Mother’s Day and I am excited to open up The Moms Project to multiple generations of women sharing visions, philosophies, and resources for every age of woman. I’m Dana…I am 48 years old and a mother of three boys. 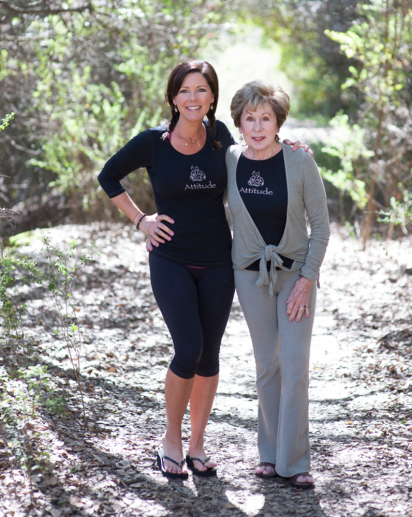 I am an actress, yoga instructor, and co-owner of Green Buddha with my mother. I used to ride motorcycles with Mickey Rourke, I completed Outward Bounds, and I grew up fishing on The Little Red River in Arkansas every summer. I am an artist and I am passionate about working on my Dollhouse I bought from an M&M commercial when I was 12. I studied yoga in Greece for a summer with my mother when I was 20. I love anything that has to do with self-discovery, therapy, group therapy, meditation, and books. I especially love learning about other people. I have been studying yoga for 28 years and I learn something new daily.